Arguably the most interesting of the Canary Islands, there is a wide variety of interesting things to do in Lanzarote (apart from nothing). 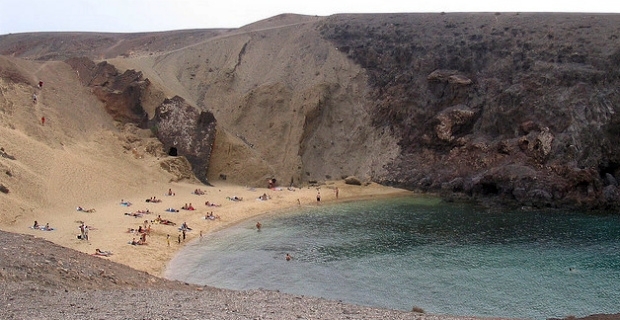 Checking out the volcanic features of the island is a must, starting at the Timanfaya National Park (entrance fee 8 euros). Here, a bus tour gives you a sense of the ongoing volcanic activity. You can also enjoy a volcano-grilled pizza in the visitor-centre restaurant. The artist Cesar Manrique is an all-pervasive and benign influence on an island obsessed by art. He came back here to escape the oppression of the mainland under Franco, and charmed all Lanzarote with his fantastic visions. The perfect introduction to his world is at his old house in Taro De Tahiche, now the home of the Fundacion Cesar Manrque (entrance fee 7.50 euros). This is like the den of a 1960s Bond villain, carved out of 5 volcanic bubbles and whitewashed. You don't need to stretch the imagination too far to imagine all the bohemian parties Manrique threw here. The art on display features works from Manrique himself as well as his contemporaries, Picasso and Miro. There's more Manrique magnificence at Jameos De Agua (entrance fee 8 euros), a natural amphitheatre formed by volcanic activity. The elegant complex features a theatre, swimming pool and performance spaces. If all that culture is becoming a little exhausting, head for the club strip along the shore at Puerto Del Carmen. This is where the nightlife and the northern Europeans cluster, and if it all gets a little too outrageous, just tell yourself that what happens in Lanzarote stays in Lanzarote.